The Moto X and the Motorola Droid Turbo are two great examples of high-end hardware combined with great bang for buck and price. The Moto X was introduced at IFA Berlin 2014 and was later launched to widely positive reviews. The Moto X price is one of its main selling points, since with flagship specs, the device has a a very competitive price which is pretty hard to beat. If you’ve seen the Nexus 6, you probably thought that you were looking at a Motorola Moto X – only bigger. 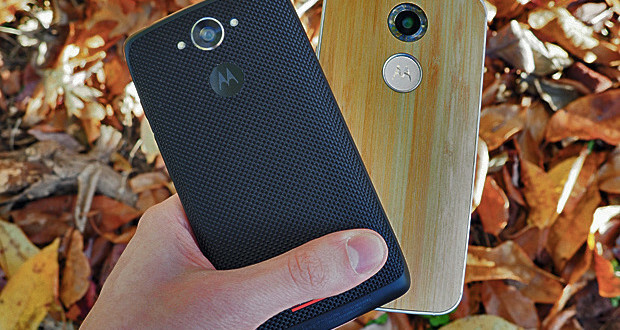 The Moto X and Nexus 6 do have a lot of things in common, especially design. Since Motorola is also behind the Nexus 6, you can clearly notice the curved lines of the chassis and the minimal bezels on the Nexus 6. That’s valid for the Moto X, too, which has an ergonomic design and a pretty nice feel to it. One of the best features or should I call it utility, of the the Moto X is that you can choose the type of chassis you like through Moto Maker. That means that you can choose from a variety of materials and colors and make the Moto X completely your own and representative of your style. Much like what OnePlus tried to do with the StyleSwap covers for the OnePlus One, Motorola successfully gave users a variety of choices when it comes to their smartphones. The Motorola Droid Turbo is a Verizon exclusive smartphone in the Droid line. It does have an international version which was first launched in Brazil, called the Moto Maxx, which has the same specs and reflects the same design, but without the Verizon logo on the back. Since these phones are the same, consider this comparison to be valid for both of these phones, aside from availability. The Motorola Droid Turbo was very hyped on the internet before its November launch, rumors and speculations about the device skyrocketing in numbers. With good reason, though, since the Motorola Droid Turbo specs were over the roof and out of this world in the eyes of many. With the pretty average flagship specs of the Moto X, many were taken aback about what was being said about the Droid Turbo. After the Droid Turbo was launched by Verizon and Motorola in November, the Moto X kind of faded a bit in the eyes of the consumer, since the new Droid was taking up all the limelight. Nonetheless, the Moto X remains one of my favorite smartphone releases of the year because Motorola proved that it can release a cheap flagship with competitive specs without having to slap a huge price on it. Making the phone customizable is an added benefit which is one of my favorite and others’ part of the phone, as I’ve said before. The Droid Turbo design is a bit bulkier than the Moto X design, the first one weighing 169 grams, while the Moto X is lighter at 144 grams. Even though many users enjoy the solid feel of the Motorola Droid Turbo, the Moto X would be better for those of you who don’t like feeling your phones that much in your pocket. Nonetheless, the Moto X design is one of my favorites because it is ergonomic and easy to hold, and it doesn’t slip as easily out of your hand as the iPhone 6 Plus does, for example. One big minus for both these smartphones is that neither of them have microSD card slots. While you can make do with the 32 GB version of the Moto X, you might want to abuse some cloud storage options if you buy the 16 GB one. You shouldn’t have issues with the Motorola Droid Turbo though, since it comes with either 32 or 64 GB internal storage. The Motorola Moto X display is a 5.2 inch AMOLED one with a 1080*1920 resolution amounting to 424 ppi pixel density, which is more than enough for the average human eye. The Motorola Droid Turbo display on the other hand ups the ante with a 5.2 inch Super AMOLED display with a QHD resolution amounting to a whopping 565 ppi pixel density. Although the difference in resolution in barely noticeable unless you put both the phones next to each other, the Moto X display should be sufficient for the average smartphone lover for the next year since QHD resolution isn’t being used as much by apps and videos, unless you’re watching some 4K GoPro footage. While both the Moto X specs and Droid Turbo specs include NFC, only the latter has the added benefit of an IR blaster, which might come in handy for those of you who like to use their smartphones as remote controls. While it’s not such a big feature, infrared on a phone seems to me as an important trait that many would benefit having. Nonetheless, NFC seems more important and more future-proof, so you should be content with that. When it comes to Moto X specs, they are outdone by the Droid Turbo, which boasts a Snapdragon 805 CPU backed by an Adreno 420 GPU and 3 GB RAM. The Moto X has the Snapdragon 801 CPU running the show, backed by an Adreno 330 GPU and 2 GB RAM. Neither these configurations are bad, but the Droid Turbo can be considered a bit more future-proof than the Moto X. Even so, the Moto X can handle anything you throw at it, so you won’t be having any performance issues soon. What’s best about Motorola and implicitly both these phones is that most of the units have already received Android 5.0 LOllipop. The Droid Turbo camera is a whopping 21 MP sensor on the rear with dual LED flash and a 2 MP front camera. The Moto X camera is a bit inferior, measuring 13 MP on the rear with a ring dual LED flash and 2 MP on the front. Even though the Moto X takes great photos regardless of lighting conditions, the Droid Turbo is superior in definition and quality, as well as response time, which comes naturally with the superior CPU and camera put together. Nonetheless, if you’re not big on smartphone photography, the Moto X should do just fine for you. The Moto X batter has done well in most battery tests, measuring 2300 mAH and being capable of fast charging with Quick Charge 2.0. The Droid Turbo also has fast charging,, but incorporates a much bigger 3900 mAH battery, which can hold up just as much. I say just as much, because you have a QHD display to power on the device, which requires more power than the HD screen on the Moto X. It also has Qi Wireless charging, which should come in handy for those of you who hate wires. The Droid Turbo price is set at $600, which is more expensive than the Moto X price set at $300. As you can see, when it comes to bang for buck, the Moto X is one of the best devices you can get your hands on. Even though the Motorola Droid Turbo is twice the price of the Moto X, it still is worthy of the money with the behemoth specs and awesome camera setup. Overall, no matter which you choose, you won’t be left disappointed, since both these flagships are staples in their categories and pretty future-proof, to be honest.